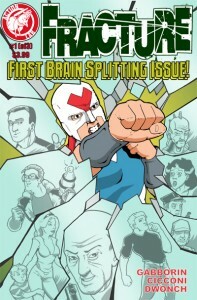 Fracture #1 from indie publisher Action Lab Entertainment is a very original take on the superhero/villain genre that features an ordinary guy named Jeff, living in the metropolis of Lower Triton. Suffering from multiple personalities that just happen to be comprised of the cities most feared super villain known as Malice, and ironically enough the cities most beloved superhero named Virtue, Jeff gets tossed into a life changing spiral as he tries to put the pieces together. When it comes to raw originality the first publisher’s name that pops in my head is Action Lab Entertainment, every genre they tackle receives an interesting and new spin that breathes new life into the genre. I found the debut issue of Fracture to insanely well written, beautifully illustrated, and home to one of the most interesting characters ever conceived. This first issue does such an amazing job at introducing you to Jeff and giving you a peek into his day to day life, that when the big reveal occurs it makes it much more interesting. By building the reader bond with normal old boring Jeff, it makes his sudden life change all that more humorous and exciting. The early segments where he first becomes aware of his alter egos while in the middle of a crime spree, and while in the middle of protecting the streets as Virtue are authentically funny and parodies the genre just enough that it doesn’t take away from the well craft superhero story that is being told. The concept of your mind housing three different people in essence, who are out to get one and another really gets one thinking all the different ways the story could play out. I am really looking forward to reading through the next two issues, and finishing the first story arc of Fracture, I feel like a broken record but I cannot emphasize enough how highly I recommend this title, and any other current title from the folks over at Action Lab Entertainment. This is not your run of the mill superhero tale, and at the same time, not your typical spoof either, the perfect blend of spandex and laughs Fracture is sure to become a house hold name among indie readers. Overall I had an immeasurable amount of fun with this spectacular debut, now if you excuse me I’m going to sit down with issue #2 because I am dying to see how this story contuse to evolve.